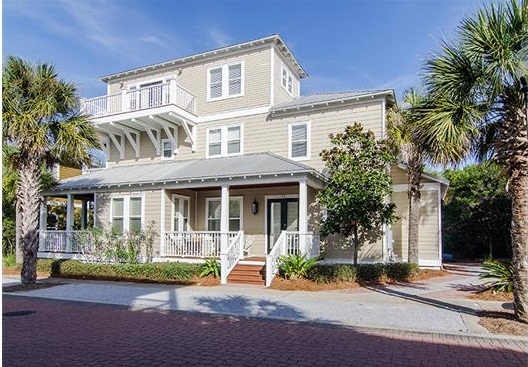 This amazing, beautifully furnished home is located just steps away from the 12,000 square foot lagoon pool at Seacrest Beach and fewer than 500 yards from a deeded beach access. Its layout is conducive to entertaining and features plenty of room for guests. The kitchen, living and dining room areas are open to one another with a beautiful new tile floor that looks like hardwood. The living and dining rooms have convenient access to the covered deck with an outdoor kitchen that features not only a built-in grill, but a double basin sink, refrigerator and stainless steel counter with plenty of cabinets. There is also a new outdoor dining set that seats six. The kitchen features granite counters, stainless steel appliances that include a separate ice maker and gas range, as well as a breakfast bar. The kitchen is fully stocked with a brand new side by side door refrigerator, microwave, coffee maker, toaster, blender, griddle, pots, pans, dishes and utensils. A laundry room with full size washer and dryer units is located just off the kitchen and features access to the back of the home and driveway where an outdoor shower is located for easy clean up after a fun day at the beach. The family room located right off the kitchen has two new, comfy Pottery Barn couches, two new wicker chairs and large, new, flat screen TV. There are double doors that lead to the back, private covered deck. Tile floors that look like hardwood carry throughout the main living areas. In the breakfast nook, is a large custom built dining table with an “L” shaped bench with plenty of seating for ten. When you walk through the front door, there is an open foyer with a powder room and a hall closet. The first of two master bedrooms is conveniently located on the main level floor. It features hardwood floors, a king size bed, large walk-in closet as well as a private bath with a jetted tub. There are three additional bedrooms on the second floor, one of which is the grand, master suite which is separated from the other two bedrooms by a hallway. There is a king size bed, new flat screen TV, a large walk-in closet as well as a private, covered deck. A comfy four piece conversation patio set is the perfect place to relax on the covered deck. In the master bath is a Jacuzzi tub, separate tiled shower, a double vanity and breakfast bar with mini fridge and coffee maker. There is plenty of cabinet space for towels and other linens. Down the hall, also on the second floor, are two additional bedrooms, one with a king size bed and the other with two twin beds both with large closets and new TVs. There is shared bathroom in the hallway with a double sink and separate room for the shower and toilet. The third-floor loft features a twin bed with trundle and provides a perfect place to lounge around and relax. This is a great place for kids to hang out, play games or watch TV. There are two sun decks off the loft, one of which faces north and the other west to capture sunsets. The one sun deck has two new lounge chairs with ottomans and a side table and a bistro set on the other sun deck. The house is large enough to give families their space but also has several common areas where families can gather together. The location is absolutely ideal. Whenever we stay at the house, we use the car to go grocery shopping and then never need to use it again! Seacrest Beach is ideally located between Alys Beach and Rosemary Beach, placing plenty of shopping, dining and entertainment options within easy reach. Convenient tram service is provided during the summer and early fall months to the nearby deeded beach access. • Outdoor kitchen with gas grill, fridge and double sink and plenty of counter space…perfect for entertaining. • Equipped with beach towels, boogie boards, beach chairs, beach umbrellas, beach toys and a cooler. • Outdoor hot and cold showers. • 3 covered porches and 2 sun decks. • Two child size bikes available. • Baby gates and booster seat available. • Parking available for two cars in the side driveway and open parking in any of the gravel spots on the street. • Short walk to the white sandy beaches with complimentary beach shuttle from March to October. • Added a key pad to the front door and back door (into the laundry room). • New Pottery Barn couches and new wicker chairs for the family room. • New tile floor that looks like hardwood on first floor kitchen, living and dining rooms. • New, large, custom built dining table with “L” shaped bench and seating for ten. • New refrigerator with filtered water/ice dispenser on door. • New outdoor dining set with a large rectangle table that seats six. • New four piece outdoor conversation patio set for the deck off the second floor master bedroom. • New lounge chairs with ottomans and table for the third floor sun deck. • New doors were installed on the third floor to both sun decks. • New chair and love seat in the loft. • New outdoor bistro set on the back deck. • New, flat screen TV’s in all the bedrooms, loft and family room. • New carpeting in second and third floor bedrooms. • All new white linens and bath towels.